Situated beautifully in the Epcot Resort area, the Walt Disney World Swan and Dolphin Resort is easy to spot with the incredibly unique architecture featuring majestic swans, enormous fish, and triangle shaped building. So, are these sister resorts worth the stay and what do they have to offer? Check out these 6 points below! 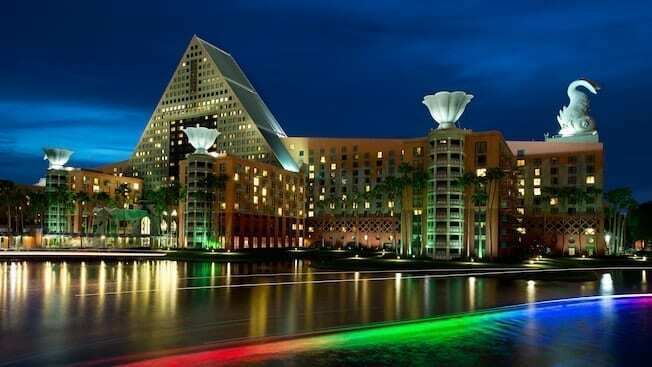 While known as the “Walt Disney World Swan and Dolphin Resort”, the Swan and Dolphin hotels are not fully owned by Walt Disney World. The land is owned by Disney while the hotels themselves are leased by Disney from the owners, Tishman and MetLife. 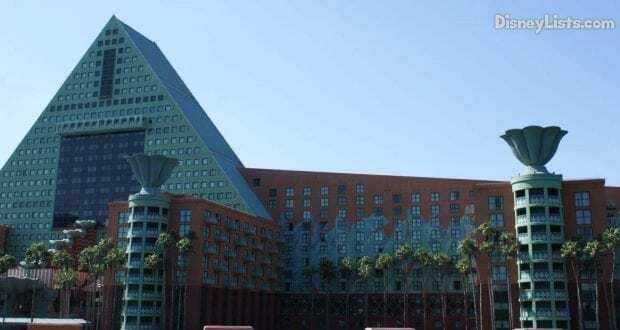 In the 80’s, Disney realized they needed a convention center resort that would provide great space for business men and women to gather for large conventions. There was an agreement with Tishman (who built Epcot) that any resort building to feature a convention center was to be in agreement and ownership of Tishman. Hence the birth of Swan and Dolphin! So, what’s the difference between the Swan and Dolphin? These sister hotels are in easy walking distance to one another and guests are welcome to walk in and out of either hotel and enjoy the amenities both have to offer. The Swan hotel is most known for the two huge swans seated on top of the building. A greater room variety is available at the Swan, including Traditional Rooms, Resort Rooms, Grand Deluxe Rooms, Deluxe Family Rooms, Suites, Governors Suites, and Presidential Suites. We personally think the Swan has better room views of the Disney World surroundings. The Dolphin hotel is well known for its triangle shape and large fish structures. While the Dolphin has more rooms than the Swan, there is less room variety. Room variety for the Dolphin includes Guest Rooms, Deluxe Family Rooms, Suites Governor Suites, and Presidential Suites. Most convention center and meeting room space is available at the Dolphin, but the Swan does offer some meeting space as well. We LOVE the Swan and Dolphin location! The Epcot Resort area is filled with daily activities, nightlife, and provides super easy access to Epcot and Hollywood Studios. Whether you want to resort hop to check out favorites such as the Yacht Club Resort, be entertained by live performers on the Boardwalk, or take a leisurely stroll or boat ride to Epcot or Hollywood Studios… it’s all within reach at Swan and Dolphin. Our favorite part of staying at the Swan or Dolphin is the dining available! We love that there is a dining spot for any occasion and any group dynamic. Whether you have a high spending budget or prefer to save your pennies – Swan or Dolphin have what you are looking for. Our favorite from the list below would have to be the Garden Grove because each night at dinner characters (typically Pluto and Goofy) appear for a great character dining experience. Garden Grove also has a Good Morning Character Breakfast on Saturday and Sundays where you might just spot Goofy, Pluto, and maybe even Chip and Dale. We also must give a shout out to the Fountain’s tasty milkshakes! The amenities at Swan and Dolphin are excellent! There are 5 pools between the two hotels, beach activities, tennis, basketball and volleyball, jogging trails health clubs, a game room, shopping, and an art gallery. Plus, chances are you may have heard of the Mandara Spa?! Offering “world class pampering and beauty services” – this spa is known by many as the very best spa on Disney World property. The list of spa treatments that are available at Mandara is shockingly impressive. So, be sure to make time – and budget for – some relaxing treatments at Mandara! 6 – Receive MOST Disney Guest Privileges… But NOT All! Swan and Dolphins hotels might not be fully owned by Disney, but guests staying on sight do receive some of the same guest privileges that Disney Resort guests receive at the surrounding resorts. Complimentary Disney Bus transportation is available to and from all theme parks, water parks, and Disney Springs. Swan and Dolphin also has great boat transportation to and from Hollywood Studios and Epcot. Plus, theme park parking is free for Swan and Dolphin guests. Guests can also take advantage of Extra Magic Hours, 60-day advance FastPass+ selections, and complimentary delivery of purchased items in a theme park and Disney Springs sent back to the hotel. There is also a Disney ticket/planning location within the hotel for easy purchasing of tickets and customer support before reaching the parks. Guests do NOT however receive a complimentary MagicBand. There is no charging to your MagicBand nor does a MagicBand work as a room key at Swan and Dolphin. Disney Dining Plans are not available at the Swan and Dolphin either. Have you had the opportunity to stay at either the Swan or Dolphin hotels? We’d love to hear about your experience!